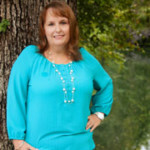 Home Home Home Decor & Improvement Southern Home & Kitchen: One-stop shopping for dining and entertaining! Southern Home & Kitchen: One-stop shopping for dining and entertaining! When mother-daughter team Linda and Jane Arnold moved to Winston-Salem to be near family, the two knew they wanted a business that focused on home and family first. The energetic duo also knew they wanted to provide customers with everything they needed to make their homes comfortable and inviting – and what room is more comforting than the kitchen? 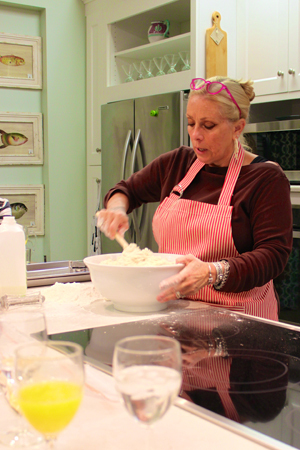 “We knew that food and cooking would play a major role in our store since this is the heart of the home,” says Linda. 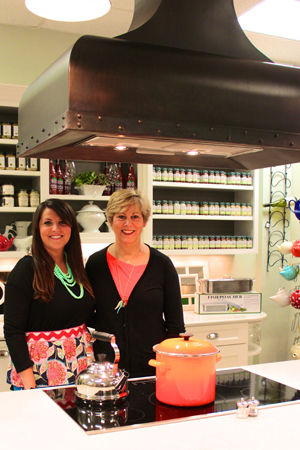 Mirroring their shared passion for entertaining and decorating, Southern Home & Kitchen opened in August of 2013. It is a true shopping pleasure if you’re a budding chef, a lover of amazing food, a seasoned hostess or even if you are more at home simply gathering neighbors in the kitchen for a glass of wine. Think of Southern Home & Kitchen (affectionately called SoHo) as a one-stop shopping mecca for anything related to cooking and entertaining, a perfect source for finding gifts for any occasion, and a shop full of charming extras that turn living spaces into homes! Connoisseurs of fashion with impeccable taste, Linda and Jane were previously owners of a Monkee’s franchise in Fredericksburg, Virginia, and they’re both well in tune with what their customers want. The two shop Gift Markets in New York, Atlanta and Chicago in order to bring back the latest trends to their Winston-Salem clientele. From the best of the best in cookware and tableware to the most unique and hard-to-find kitchen gadgets, you’ll find favorite brands such as All-Clad, Le Creuset and Vietri. The product selection covers all aspects of the home, including accent furniture, which makes shopping here such an adventure. Not only does Southern Home & Kitchen give you the tools, but they teach you how to prepare mouth-watering fare as well. The store offers cooking classes several times a week – everything from Soup 101 or a simple, seasonal menu, to Rustic Italian cooking and other popular ethnic dishes – taught by local chefs, caterers and bakers. Private party cooking classes for groups of eight to 12 can also be arranged. For the more popular classes, registering a month in advance isn’t unusual, but you can also be spontaneous. There’s also the occasional cooking demonstration on a Saturday. Best of all, you’ll cook and then enjoy eating the “dish of the day,” plus take home the recipe to add to your collection. With a staff of seven employees, the business prides itself on friendly, attentive service and exceptional value, with an expansive inventory that truly offers innovation and fun! While you shop for a perfect birthday gift – something delightfully monogrammed or a charming office accessory – you’ll likely stumble across a chic new trinket for your own home. Southern Home & Kitchen also offers wedding and gift registries, where any item can be special ordered as long as it’s a brand they carry. 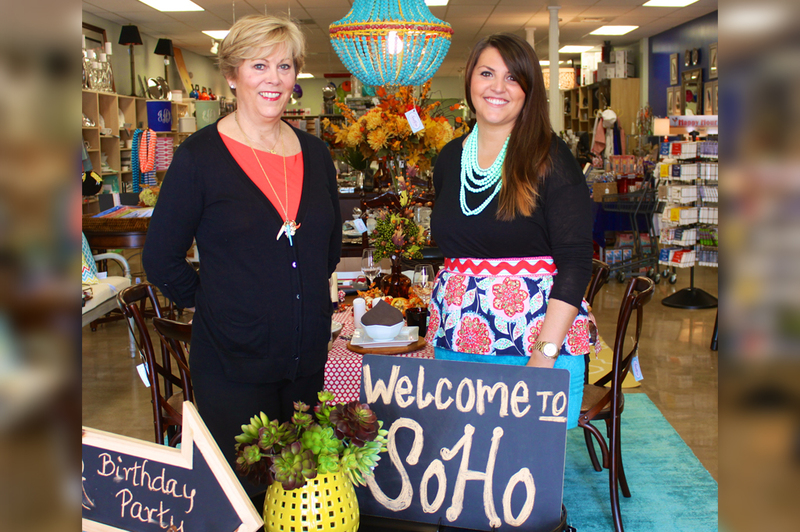 At SoHo you’ll feel welcome every time you stop by, just as owners Linda and Jane hope guests will always feel in your home! Southern Home & Kitchen is located in Thruway Center, at 200 S. Stratford Road, #110, Winston-Salem, 336-777-3660. Hours are Monday through Saturday 10:00 a.m. to 6:00 p.m. and Sunday noon to 5:00 p.m. Visit www.ShopSoHoNC.com for special event updates and cooking class schedules. Next ArticleSew Simple – Sewingly Yours makes sewing simple, fun!